The demand for consistent content creation has forced many marketers to take shortcuts. Shortcuts may enable you to get to an outcome faster, but it is often a worse outcome. Using shortcuts to create more content faster can help you to achieve more volume, but at some point, the quality goes through the floor. Quantity and quality are not opposites. They can exist simultaneously. In fact audiences today demand that they do. To meet that demand, Jay Acunzo, Vice President of NextView Ventures, identified in his presentation at Content Marketing World 2015, that you must be, or nurture in your organization, the prolific content creator. Being a prolific content creator doesn’t just mean creating more “stuff”, working faster or tapping into some secrets of the interwebs. Being a prolific content creator is something different. According to Jay there are 5 things which prolific content creators do really well in order to achieve the elusive quality and quantity of content. From these five things we can learn what makes prolific content creators different and what enables them to create a quantity of quality content. Below are the 5 qualities that make prolific content creators successful. #1 – They have an extreme bias to act. The average content creator may feel paralyzed by research and process, and this can stop them from acting. The prolific content creator jumps right in, rather than toeing the water. 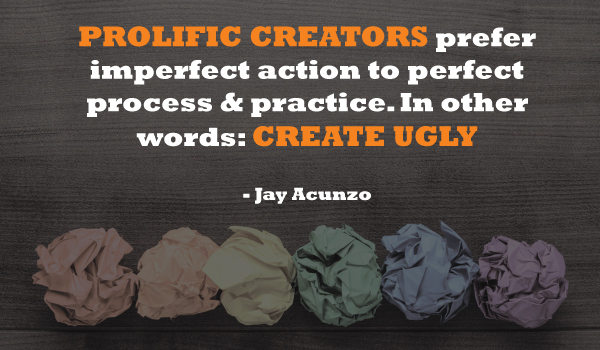 Prolific content creators prefer imperfect actions, to perfect process and practice. In other words, they are comfortable creating ugly. They are able to get started and figure it out along the way. How to Be a Prolific Content Creator: Dive in and create ugly. #2 – Work their creative muscles often and in new ways. The best way to improve your creative skills is to practice. Prolific content creators often do side projects, as a way to work out creative muscles. Side projects allow the mind to wander outside the day-to-day grind. It’s a way for content creators to use muscles not used for day jobs. Side projects may be freelance work, a personal blog or a pro bono project. How to Be a Prolific Content Creator: Make time for side projects. #3- They have an intrinsic desire to create. Prolific content creators find a sense of satisfaction in the creation of content. They are nurtured by positive feedback or rewards, which helps feed their satisfaction in content creation and encourage them to do more. They are also known to study content for its own sake. This means drawing inspiration from other creators and building their own unique ideas. These content creators exist in an environment where taking risk and experimentation is nurtured and rewarded. Doing something new and different, is often when the best, most creative things happen. Being able to try new things, nurtures the desire to create. How to Be a Prolific Content Creator: Find joy in the process. #4 – They can take one idea and use it to sustain output. Prolific content creators are great at creating idea pipelines to ensure they have a list of concepts from which to consistently draw. Idea pipelines can be organized in Evernote, a content management system or even just a spreadsheet. They can include things like series content, underserved topics or a list of brainstormed content. How to Be a Prolific Content Creator: Turn one good idea into many more. #5 – They leave industry echo-chambers. Prolific content creators don’t just read the same marketing blogs as everyone else. If all creators consume are marketing blogs or lists, that is all they will be able to create. Prolific content creators go outside of their industry and are inspired by other things such as art, media or manufacturing. Their creativity is drawn from the ability to connect something outside their niche to their daily work. How to Be a Prolific Content Creator: Find inspiration in many diverse places. Jay also pointed out that creativity is not a talent; it’s a way of operating. Prolific content creators do have unique traits which drive their talent, but it’s not necessarily intrinsic. You or others within your organization can learn to operate in a way that’s different, that drives the proliferation of content. Then it no longer has to be a choice between creating quality or quantity of content. There are NO shortage of great writers & subsequently great content to piggyback off of..
That being said, there is a huge misconception of how to promote your own content.. It is NEVER as simply as THEY say.. write a blog post put it up… VIRALITY.. I just stumbled on this and I have to say what a fantastic article. It really encourages others to think outside the box. Wishing to read more.